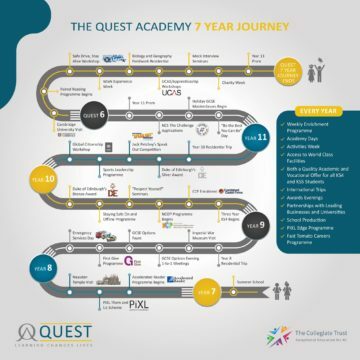 Last week, in assemblies with all students, we were delighted to officially launch The Quest 7 Year Journey: the unique and diverse range of quality additional activities that students enjoy during their secondary career with us so that they can develop the skills and experiences to lead successful and fulfilling adult lives. Below you will find a copy of The Quest 7 Year Journey poster that is now in every classroom across the Academy. As of September 2019 it will be at the heart of the student planner, and in the coming weeks an interactive version will appear on the Academy’s website. This, of course, is not an exhaustive flight path of all the fantastic work that goes on in the Academy every day, rather an overview of the highlights that we think makes the experiences we provide genuinely distinctive and transformative, a fulfilment of our motto in practice – learning changes lives. We were delighted last week that the official Department for Education’s performance tables placed the achievements of our students in the top 30% of schools nationwide, and one of the top performing mixed comprehensive schools in Croydon at both KS4 and KS5. These outcomes and our Quest 7 Year Journey programme are indicative of our commitment to educating the whole child holistically, ensuring that each student succeeds academically and personally. The dynamic and diverse array of additional extra and super curricular activities that have occurred across the last fortnight alone will give you a flavour of how students are already receiving the benefit of The Quest 7 Year Journey in practice: music and drama trips to West End productions; Emergency Services Day for Year 8; a visit to Oxford University for Year 10; and the History Trip to Krakow, Poland. More information on these events can be found on the Latest News section of the website.